In less than one month's time a second young Oregon State Trooper was to lose his life in the line-of-duty. 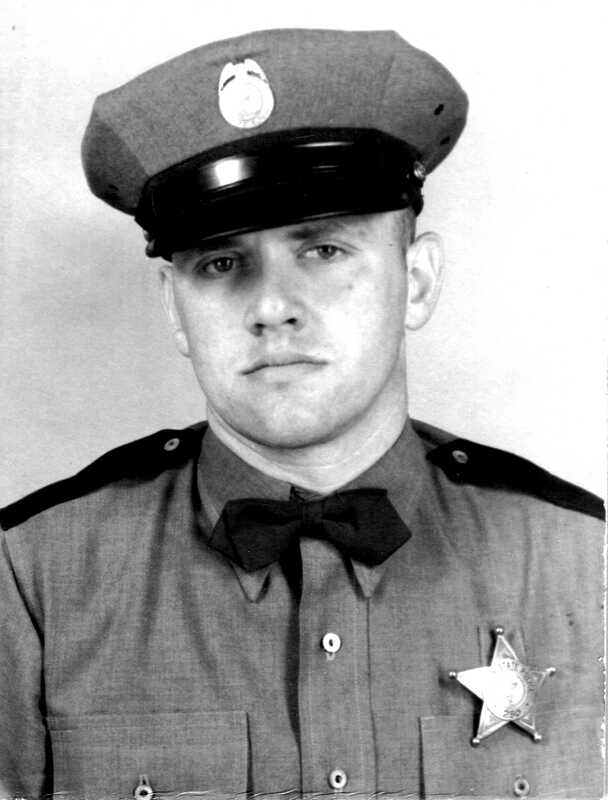 25 year old Trooper Dale B. Courtney had joined the State Police on June 19, 1950. He was formerly a police officer for the McMinnville Police Department and had served in the United States Army during World War II. Two youths, 15 year-old John Wilson of Newberg and 14 year-old Harvey Francis O'Day, formerly of California, had escaped from the Oregon State Training School in Woodburn on Saturday, October 1, 1950 and had fled in a stolen car to a farmhouse near Tigard. O'Day had been sent to the training school for car theft. A local farmer, Fred Plieth, had noticed two young men on nearby property and had directed Trooper Courtney to check on them. Courtney tried to flush the two escapees from the empty farmhouse but O'Day had a shotgun and fired hitting Trooper Courtney in the face. O'Day then turned the shotgun on Plieth hitting him with three pellets in the leg but Plieth was able to escape and call for additional police. The two murderers stole Trooper Courtney's handgun and fled in the car they had stolen in Woodburn. Four miles down the road they stopped at another farmhouse and rousted the owner out of bed and stole her 1942 Green Buick Sedan. They boasted to her that they had just killed a cop and were not afraid. About a half hour later the two held up the Twin Oaks service station stealing $2.15 of gas and two packs of cigarettes. They then fled west and were attempting to steal California license plates from a car near Blaine when they were spotted by the owner of the car, Cecil Chambers. They shot at him but narrowly missed. Chambers tried talking them into giving themselves up and they finally agreed to surrender to police in Tillamook. They told Chambers that he could follow them in his car to Tillamook. Apparently they were lying or changed their minds on the drive west and shortly thereafter attempted to race away. In doing so they lost control of the car and crashed. They then fled on foot into the woods. The two were captured several hours later by State Police Troopers W. A. Ummel and T. E. Green when they emerged from the woods near the wrecked car. They were arrested and lodged in the Washington County Jail in Hillsboro. Dale Benjamin Courtney was born June 29, 1925 in Yamhill County, Oregon to Benjamin Harrison Courtney and Arlie May Hickerson. Dale's father died in 1941 at the age of 46 leaving his widowed mother and an older brother, William A. Courtney in addition to Dale. Trooper Courtney was married and he and his wife, Sylvia, had a daughter Casey. Trooper Courtney was a member of the American Legion and they conducted the funeral services. There was a large contingent of the Oregon State Police in attendance. Trooper Courtney is buried at the Evergreen Memorial Park in McMinnville near his parents.